Opening Lines: Because I got a terrible suitcase for my going-to-school present instead of the red backpack with yellow rockets and a silver zipper, I was mad. MAD, mad! Synopsis: A young girl’s first day of school is marred by the new suitcase she received, instead of the backpack she was hoping for. Inside her imagination corner, cardboard box in class, her suitcase becomes an instrument of her imagination. 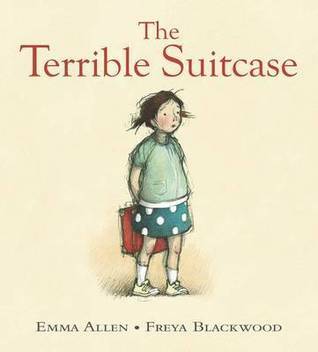 Why I like it: Kids will love the interaction between the kids in this story as we go through a young girl’s day and her reactions due to her disappointment of having a suitcase instead of a backpack like all the other kids. Isn’t it the pits, to not get what you want. Imagination is a great thing though. The transition between what’s fact and what’s imagination is smooth and cleverly done. The little girl’s imagination and the imagination of the other kids soon show that her suitcase is unique in its own special way. Even so, it is not till you read to the very end that she realizes just how special her suitcase really is. I love the pencil drawings and expressive faces and soft hue colours. I’m always pleased to be able to bring you some more special books that have come my way and be able to share them with you and join other great writers over at Susanna’s Blog, where there are literally hundreds of book reviews to view. So pop over and visit the lovely author, Susanna Leonard Hill’s blog and find the tab for Perfect Picture Books. Her blog is full of resources links and activities associated with books reviewed by many authors. This entry was posted in Imagination, Picture Book Review, Susanna's PPB Fridays and tagged childrens books, Emma Allen, Perfect Picture Book - Friday, Susanna Leonard Hill. Bookmark the permalink. Another cute picture book. Kids will love this one! Hi Darlene, yes it is cute. Thanks for stopping by. Ha, yes Joanna. And don’t you feel like the odd ball when you see all the other kids with great school bags and you have … this! Surprisingly things change almost… overnight! Oh yes Pat, it does remind me of Anne Shirley too. Yeah I love the illustrations they are cute and very expressive. Thanks. I love the cover. She is hiding the suitcase and it makes me want to know why. Hi Sue. Oh wouldn’t you want to hide yours if everyone else had the latest backpack and you were given a…. suitcase! 🙂 It’s wonderful that kids can use their imagination. For example (and not giving too much away) a backpack wouldn’t make a great “tool box” like a suitcase can, huh? 🙂 Thanks for stopping by. Seems I didn’t phrase my comment well. I did read your lovely review. It makes me want to read the book. I was trying to say the cover also entices me, it makes me wonder why she is hiding her suitcase. If I saw the cover in a bookstore (the few left) I would pick it up to find out why. Good cover.